Thanks to one man’s vision, Fairview Hospital of Great Barrington, one of three Critical Access Hospitals in Massachusetts, has become known as a leader in creating progressive, nutritional value for its community. Roger Knysh, a long-term employee of Berkshire Health Systems’ foodservice department, directs all dietary activity within its affiliate, Fairview Hospital. He has made it his mission to provide daily access to nutritious options for patients, staff, and the community. Drastic changes for Fairview began in 2006, when Knysh signed the Health Care Without Harm’s Healthy Food Pledge on the hospital’s behalf. Fairview was the first hospital in Massachusetts to sign the pledge, and Knysh immediately got to work implementing its requirements to provide fresh, healthy food for those they serve. Roger understands that the hospital sets the tone for the community. We take care of sick people, but in a broader sense, we are setting a standard as a role model. Fairview Hospital’s foodservice cooks with fresh ingredients from their hospital garden. After signing the Healthy Food Pledge, Knysh decided one of the best ways to provide fresh food was by growing their own. He constructed an on-site private hospital garden that produces tomatoes, cucumbers, onions, lettuce, garlic, basil, peppers, and broccoli, to name a few. The produce is planted and harvested by foodservice staff and used in Fairview’s kitchen on a regular basis. The 40-foot by 20-foot garden has continued to expand every year, creating a sustainable source of fresh fruits and vegetables. The Wholesome Wave’s Fruit and Vegetable Prescription Program (FVRx) [now called Wholesome Rx] is another program working to create access to nutritious food for patients. This national program, which has been implemented in 12 states and 35 rural and urban healthcare facilities, makes fresh produce affordable for patients who suffer from diet-related health problems. Headquartered in Bridgeport, Connecticut, FVRx is gaining ground in underserved areas as a simple way doctors can provide nutritious incentives for patients. Providers can “prescribe” nutritious food in the form of free vouchers which are typically equivalent to a dollar a day. The vouchers can be redeemed for fresh produce at local food retailers. Donations and grants from local foundations, city and state agencies, as well as hospital investments, have been used to fund the incentives. The Heart Healthy Lenoir Project (HHL) (no longer available online) is a research-based initiative intended to identify models that make a difference in people’s health. Funded by the National Heart, Lung, and Blood Institute, HHL creates resources and tests ways to reduce heart-related problems in Lenoir County, North Carolina. One method that has proven true is nutrition education. Dr. Alice Ammerman, professor of nutrition in public health and director of University of North Carolina’s Center for Health Promotion and Disease Prevention, has been an active researcher for HHL. As fried food and barbecue are favorites of many in the region, part of Ammerman’s work is developing new recipes and teaching North Carolinians how to cook their Southern comfort foods in healthier ways. 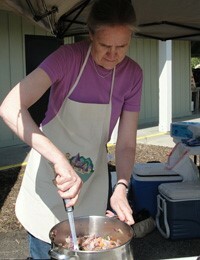 Dr. Alice Ammerman teaches Lenoir county residents how to cook their Southern favorites in a healthier way. For example, HHL has helped several veggie vans and small farmers’ markets launch in Lenoir County. To cut the price for patients and community members, hospitals and insurers in some areas help subsidize the cost of fresh produce. The successes of Fairview Hospital, FVRx, and HHL are largely due to their willingness to go above and beyond to ensure that as many people as possible gain regular access to nutritious food. 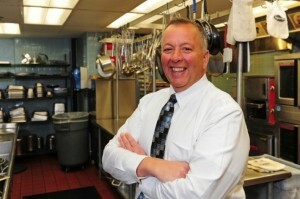 Roger Knysh, director of nutrition and foodservices for Berkshire Health System, Massachusetts. Knysh took a big risk in 2010 when Fairview Hospital became one of the first in the nation to remove sugar-sweetened beverages from room service menus, staff meetings, vending machines, and the cafeteria. The task was not easy. At first, he experienced some push-back, but constant staff education and support from Fairview’s administration kept the momentum going. The staff and community have since come to embrace this change, among many. Smith agrees with Knysh on the necessity of being unconventional. 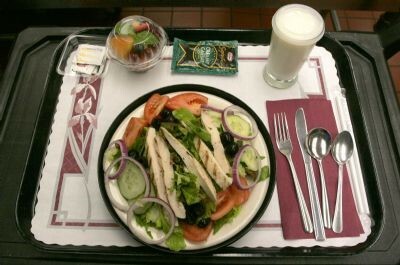 “We are at a place with hospital food where expectations are low. (Healthcare facilities) that are changing things are going to get that ‘wow factor’ back,” predicts Smith. In Skowhegan, Maine, Dr. Michael Lambke, family practice doctor and medical director of Redington-Fairview General Hospital (RFGH), works hard to help his patients fully benefit from FVRx. In order to receive an FVRx prescription, his patients must enroll in a six-month course developed by Lambke and his medical team. Sessions engage patients in fun, physical, and nutritional activities such as hula-hooping, dancing, hiking, and cooking lessons. Community organizers skilled in motivational interviewing are brought in to encourage patients in their healthy adaptations. Because of this tactile approach, “We have great retention…and are making a significant impact not just on the child, but also on their family members,” attests Lambke. Dr. Lambke meets with an FVRx patient at the Redington-Fairview General Hospital. In order to educate patients on nutrition and healthy food choices, providers themselves need to know how to best conduct that conversation. HHL and FVRx have created some key resources to equip providers to incorporate nutrition discussions when treating a patient. Dr. Tom Keyserling, professor at UNC School of Medicine and internist at multiple hospitals in North Carolina, contributes to HHL research. As a doctor, he describes one of the difficulties medical providers face. “One of the challenges of primary care is figuring out how to convey meaningful lifestyle messages in short office visits. After (medical care) is given, there is not much time for lifestyle counseling. Doctors need to have tools to use and resources to turn to,” stated Keyserling. This dilemma has motivated much of HHL’s work. The past few years, researchers have developed materials to make it easier for clinicians to have nutrition discussions with their patients. Keyserling now uses Healthy Eating Materials (no longer available online), Healthy Lifestyle Tips (no longer available online), and other HHL tools during office visits. FVRx has been successful in improving rural residents’ access to healthy food across the nation since its inception. Read more about this program in the RHIhub’s Rural Health Models & Innovations. As FVRx is moving into more underserved territories, FVRx Senior Program Manager Amanda Morgan recognizes that rural providers know the challenges their patients face as well as the best solutions to their health problems. “They are in a unique position to help their patients understand the connection between the food they are eating, the lifestyle choices they are making, and the impact those are having on their health,” stated Morgan. Through offering a prescription for healthy produce, FVRx provides a tool that can aid rural physicians’ efforts. “With the FVRx program, providers can make explicit connections between educating patients about the importance of consuming fruits and vegetables and empowering them with resources to facilitate those healthier food choices,” said Morgan. One key principle of all three programs is teamwork. The more people that are working together, the easier it is to achieve goals than if working alone. Partnerships have played a large role in increasing awareness of their services and the overall impact on their patients’ health. For Knysh, partnerships have been built through purchasing foodstuffs from local farmers and organizations like Berkshire Grown, instead of strictly buying from foodservice vendors. “We developed a shared vision of building an alternative food system that is deeply rooted in the concept of supporting local producers and vendors,” stated Knysh. In most cases, food retailers are interested in having an opportunity to be a part of a program that is increasing their community’s access to affordable, healthy food. HHL is seeing a change in dietary patterns of Lenoir County residents. They are currently working to expand their reach outside of North Carolina. Read more about HHL in RHIhub’s Rural Health Models & Innovations. His efforts have paid off. The Skowhegan Farmers’ Market has become one of the most successful in Maine. By partnering with it, RFGH and Lambke have been able to improve the health of many of their town’s residents. This entry was posted in Features and tagged Critical Access Hospitals, Food security and nutrition, Hospitals, Maine, Massachusetts, North Carolina, The South on March 30, 2016 by Jenn Lukens.